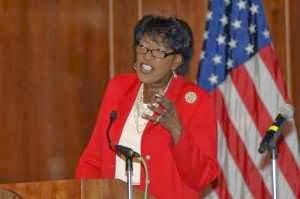 Gwendolyn Boyd, the new president of Alabama State University, signed a contract with the school’s trustees that forbids her from allowing a lover to “cohabitate” with her in the presidential home being provided to her by the historically black university in Montgomery. The contract, signed Jan. 2, 2014, was obtained by The Birmingham News and posted here. It provides Boyd with an annual salary of $300,000, starting Feb. 1, 2014, plus a number of standard fringe benefits such as insurance. This sounds ridiculous, but a few years ago no one would have raised an eyebrow. After all, the university is the landlord, and the landlord is always allowed to limit how many people live in the house. Furthermore, the president is living on campus as an important role model for students, and her contract could certainly have a morals clause. In an earlier day, she would have been expected to refrain from any sexual relations outside of marriage. But now, female sexual freedom is more important than other considerations. Marriage is dead, as a moral example for our youth. The guidance documents included striking data on racial inequities. For example, African-American students represent only 15 percent of public school students, but they make of 35 percent of students suspended once, 44 percent of those suspended more than once and 36 percent of those expelled. Statistical information does not in itself prove discrimination. But research has shown that black students do not engage in more serious or more frequent misbehavior than other students. Really? Black kids are behaving just as well, but racism is getting them kicked out of school? Studies have consistently shown that women of European descent are the worst mothers. They endlessly coddle their children and are incapable of setting the boundaries kids need to thrive. But when you look at the evidence, it becomes clear that overall white people are inferior and should not be a allowed to procreate. I'm sure if Neil Armstrong had a Tiger Mom he would have gotten all the way to Mars. If you absolutely must have children, do what I did: marry into one of the successful cultural groups. Like most Chinese women, I didn't marry for love. No, I married for one reason and one reason only: the Jew-genes. My husband is Jewish and my children are perfect little Sino-Judaic hybrids. "What strikes me about the story is, this is an institution that is facing real problems ... including allegations of improper payments to family and friends of board members. Yet, someone on the board, or someone with considerable influence on the board was able to get this truly weird and inappropriate clause inserted into a contract presumably designed to bring someone in to straighten out the university's problems. Prurient interest combined with lack of perspective at the very top does not speak well for Alabama State."